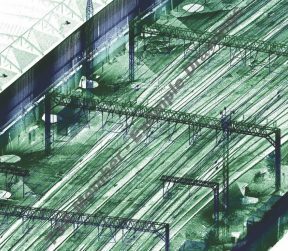 As a general rule, railway surveys are undertaken and presented in 3D. Recent developments in point cloud data extraction have led to diverse methodologies being used to gather survey data while making the most of limited access opportunities. For example, a track measuring device could be used to survey the track position and undertake a kinematic scan at the same time. This could then be infilled with static, or UAV derived point cloud. All datasets are then merged to generate a whole survey, which wireframe models can then be extracted from. 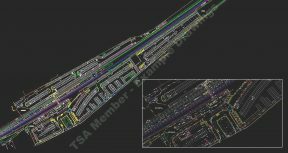 Where elevations are required, these are generally created from point cloud data which is often collected at night. 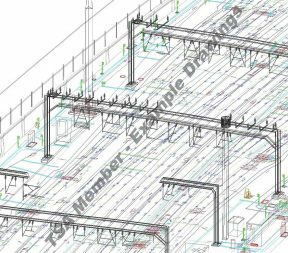 Elevations can either be obtained by the extraction of line-work from the point cloud, or increasingly by creating a 3D BIM model from the point cloud, and then extracting 2D layouts from the model. Station topographical surveys tend to be carried out with Total Station, although this is increasingly being integrated with laser scan data capture to minimise time on site. Surveys of stations are often governed by access constraints, with busy stations being surveyed during the night to minimise public interface. In general, surveys will be orientated to a project or route grid and it is often necessary to reference existing trackside control. 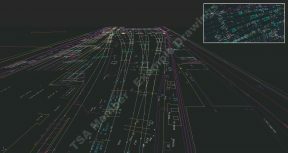 As a general rule, railway surveys are undertaken and presented in 3D. Recent developments in point cloud data extraction have led to diverse methodologies being used to gather survey data while making the most of limited access opportunities. For example, a track measuring device could be used to survey the track position and undertake a kinematic scan at the same time. This could then be infilled with static, or UAV derived point cloud. All datasets are then merged to generate a whole survey, which wireframe models can then be extracted from. This example is the STATIC & KINEMATIC approach. 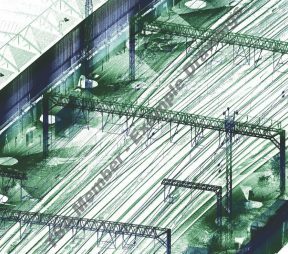 As a general rule, railway surveys are undertaken and presented in 3D. Recent developments in point cloud data extraction have led to diverse methodologies being used to gather survey data while making the most of limited access opportunities. For example, a track measuring device could be used to survey the track position and undertake a kinematic scan at the same time. This could then be infilled with static, or UAV derived point cloud. All datasets are then merged to generate a whole survey, which wireframe models can then be extracted from. This example is the STATIC only approach. As a general rule, railway surveys are undertaken and presented in 3D. Recent developments in point cloud data extraction have led to diverse methodologies being used to gather survey data while making the most of limited access opportunities. For example, a track measuring device could be used to survey the track position and undertake a kinematic scan at the same time. This could then be infilled with static, or UAV derived point cloud. All datasets are then merged to generate a whole survey, which wireframe models can then be extracted from. This example is the WIRE FRAME only approach.